We are always looking for people who can volunteer in a variety of roles as we rely on volunteers to help us run our various charitable services. 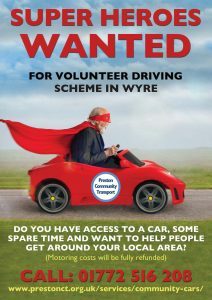 We look for minibus drivers (we provide training) to drive our vehicles, drivers with their own cars, and others who want to help with office work, fundraising, marketing and of course Trustees. Our volunteers enjoy helping and meeting other people and get a lot of satisfaction from contributing to the success of the services. Volunteers are entitled to reimbursement of out of pocket expenses, the details of this are covered in our volunteer agreement. Community Car drivers also benefit from fully expensed motoring costs as well as additional insurances to protect their excess and bonus. Please get in touch on 01772 204667 option 3 OR email redrose@prestonct.org.uk. We’ll discuss things with you and email information before arranging to meet up. If you just want to go ahead and apply with us then you can use these forms OR click this link to the Do-It volunteering website.